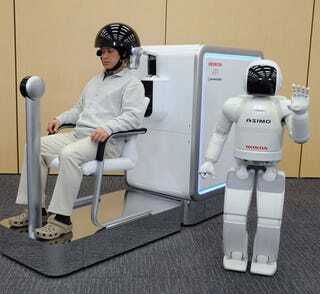 Apparently, the people at Japan's Honda Research Institute had the same idea, because they've now partnered with ATR and Shimadzu Corp. to come up with a way to use your brain as a robot remote control. Called BMI (Brain Machine Interface – not the acronym that tells you you're fat), the tech uses electroencephalography, which measures slight electrical currents, and near-infrared spectroscopy, which looks at brain blood flow. Putting the two together gives you up to 90% accurate robot control without the use of physical implants.